The Southern California Linux Expo is proud to announce a conference for the next generation of free and open source (FOSS) community enthusiasts. 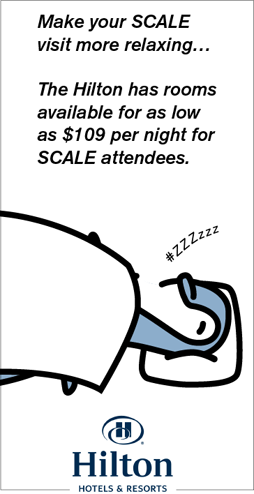 SCALE: The Next Generation will be held Saturday, January 21, 2012, at the Hilton Los Angeles Airport hotel. We invite the youth of the FOSS community to share their enthusiasm and excitement about FOSS projects with the other young people. Talk submissions are reviewed by a committee of youths, parents, and volunteers planning the conference and evaluated solely on their merits. We request that submission dates be strictly honored in order to provide the committee enough time to choose the best set of proposals. - a laptop running Linux with a PDF viewer as well as LibreOffice or OpenOffice. Presenters will have the opportunity to give a 20- or 45-minute presentation. We ask that the desired time slot be mentioned in the submission. The goal of both SCALE and SCALE: The Next Generation is to educate and encourage excitement about FOSS. Because of this we ask that all presentations be submitted in a free and open format, such as OpenDocument Presentation (ODP) or PDF formats. Additionally the conference will also provide space where the next generation FOSS enthusiasts can see free and open source software and hardware projects in action. We encourage those youths interested in showcasing a project that they themselves are involved in or simply excited about, to submit a one paragraph description about the project and what attendees can hope to see.